While initially the plant did start on KV hulls, that function was transferred to Factory No. 200 which was a satellite of the new combined facility at Chelyabinsk. After perfecting a method of using chilled steel molds to cast KV turrets, in November 1942 the factory was once more reprofiled to work on T-34 tank hulls. But while this was all going on, in August 1941 the VGK in Moscow and the Artillery Directorate asked if UZTM could design and build assault artillery. They acknowledged they could and immediately began to work on a platform for the 122mm U-11 howitzer. But this was an assault gun version of the KV-1 (later KV-9) and was not accepted for service. While involved with all of these prototypes, another project, the SG-122, did go forward with prototypes arriving for test in May 1942. This showed promise but needed work. 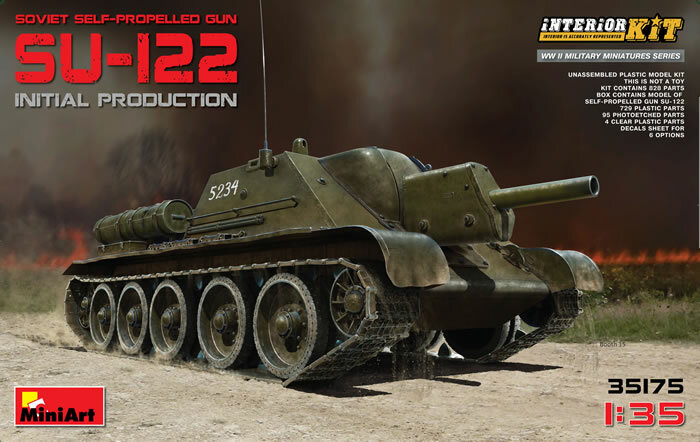 In October 1942 contracts were signed with the Main Artillery Directorate (GAU) and work commenced in earnest on a T-34 chassis with a 122mm howitzer. This emerged a month later as the SU-35 (service designation SU-122). The SU-122 was a lighter vehicle than the T-34, but used the same armor protection basis of 45mm all around with a casemate at the front. The 122mm M-30 howitzer was mounted on a pedestal at the front of the casemate and fitted with an armored shroud. Production began in December 1942 and continued until — with improvements (like all T-34 based vehicles) being introduced as they were created. A total of 638 SU-122s of all versions were built. The vehicle was a big success, able to keep up with infantry and tanks and with its useful 122mm HE-FRAG round able to level any typical enemy strong points in front of the vehicle. 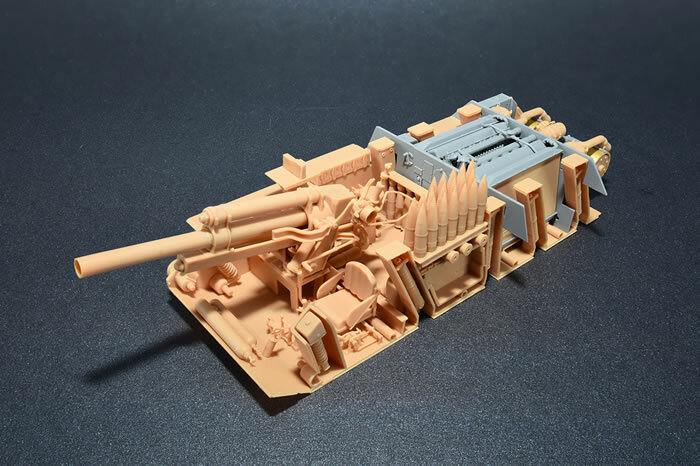 Roughly 40 years ago Tamiya introduced the only kit of the SU-122 that was available in styrene, but it shared a poor chassis with their T-34 tank kits of the day. 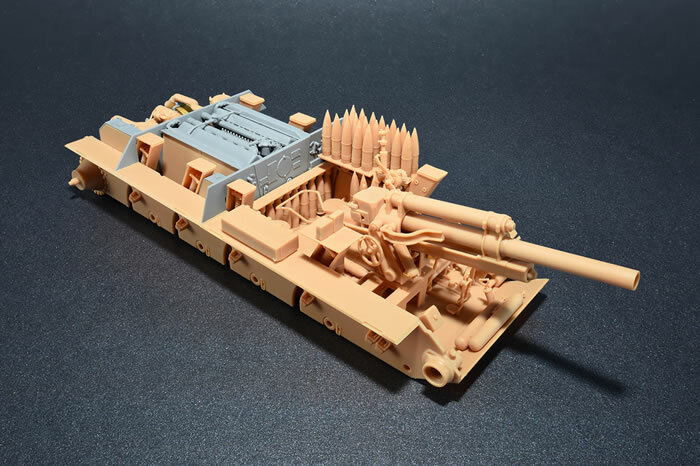 Now the resurgent Miniart has released two kits of the vehicle (initial production with a full interior and mid production without one) of which this is the former. And it is quite impressive. The model seems to match up reasonably well with the blueprints with some differences in the spring tower locations and the firewall, but none of these seem to have a major impact on the overall accuracy of the kit (especially if the hull is cemented together and only hatches are left open for viewing the cramped interior!) 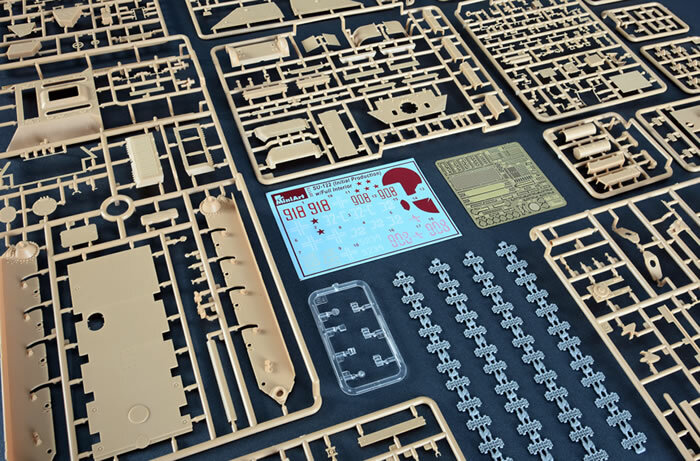 Note that the kit is typical of recent Miniart efforts with the kit on some 65 sprues and one fret of etched brass. Assembly starts with the V-2 engine (shared with the T-44/T-44M kits) but with the use of the earlier V-2 parts and not the later V-44 series ones. Only the injector tubing seems missing from the engine as it comes with all of the other items including radiator balance pipes and fittings. The transmission includes the shift linkages and all accessories such as the generator/starter. The brakes have a correct “ribbon” from etched brass and the proper actuating gear. However, all of the control rods are molded to the belly plate (B2) and not separate; considering they are on the floor of the hull this is not a big whoop. The last parts of assembly cover the rear upper hull and fenders as well as the engine deck. They provide both a complete etched radiator exhaust grille (the big one at the rear of the engine deck) or a single part “quickie” solid styrene one. When completed the rest of the model is then assembled to include mudguards and external items such as the auxiliary fuel tanks. Finishing instructions cover a total of six SU-122s, one each from the first two units to receive the SU-122 and four others: Bort 918, 1433rd SP Arty Regiment, Volkhov Front March 1943 (whitewash over 4BO green, red stars and numbers); Bort 908, 1434th SP Arty Regiment, Leningrad Front December 1943 (whitewash over 4BO green, red numbers with shadow stars and numbers under the whitewash, red circle air mark); Probable 5th Guards Tank Corps, Voronezh Front, August 1943 (4BO green, white bort number 5234); Unidentified unit, 1943 (4BO green, white bort 32-S); Unidentified unit, 1943-44 (4BO green, white bort 32 in four places); Captured gun, Eastern Front 1943 (4BO green with faded bort number 1614, white Greek crosses on sides, front and rear). A good-sized decal sheet is provided for these markings.